wonderful suprise! CLEANING FEE INCLUDED! $175.00 value! Depending on the size of the vehicles 2 to 3 cars in driveway. No street parking . Private pool, Air Conditioning, 2 porches, Landscaped and maintained grounds, Pool service, Ceiling fans, 4 cable T.V's, main T.V. 40" HD, 2dvds, microwave, dishwasher, fully appointed kitchen, washer& dryer, Bedding: Master bedroom King Bed & 2nd bedroom King bed, in 3rd bedroom:queen bed and two twins day bed trundle, and queen sleeper sofa in living area. Heated pool optional! The Sundial is 2 blocks to the beach. All rentals run from Saturday to Saturday in season. Check-in time is 3 p.m. Central Time Zone and check-out 9 a.m. Central Time Zone.This is a non-smoking home--smoking permitted outside. Cancellation policy 60 days for a full refund. Soon as we walked in we loved that it had a being at your own place feel.. And the master bedroom was in front away from the kids so we had our own privacy from the other two rooms since we are early birds . We were a short 5 minute walk from the beautiful white sandy Crystal Beach , Plenty of restaurants and shopping a few blocks away .. could walk or drive to .. The pool was the best part for me .. I could lay there , relax and watch kids swim for hours at a time .. This place was awesome! The house is in the perfect location; close to everything, but in a quiet residential area. When we walked in, we instantly felt at home. The furnishings were very comfortable, and perfect for a vacation. I've stayed in places that have been completely renovated, and while nice to look at, it actually makes it harder to relax. Everything was nice and clean, but not so perfect you couldn't enjoy it. The kitchen was very well stocked, and the open layout was great for hanging out as a family even when someone was cooking. We paid extra to have the pool heated since we were staying in early April, and let me tell you it was worth every penny! The ocean was freezing, but the pool temperature was amazing. It felt like a warm bath. The pool felt a little cooler one day, so I called the owner and he had someone out the next morning to fix it. Excellent customer service! We brought our dog with us, and he loved the house too. Dogs aren't allowed on the beaches, but there are trails and a bunch of pet friendly restaurants. Our dog loved hanging out with us in the fenced in backyard and chasing the lizards. Overall, this is a great place to stay. If we hadn't already booked our summer vacation, we would have booked this place again! Great family vacation at the Sundial Cottage! We stayed at the Sundial Cottage in Crystal Beach. Our family loved the house and we felt very much at home. The cottage was spacious , comfy, and very clean and well maintained. Our family really found a needed break and some family time on this trip! The beach was great and we hope to return next year! I would highly recommend the Sundial Cottage! Sundial Cottage: Great stay !! We stayed at the Sundial Cottage a few weeks ago and I was actually looking for a possible trip back to the Sundial in the Fall. This cottage was perfect for our group and we loved the private pool! The cottage offered everything we could want and was clean and nicely decorated. Great location and we loved sitting on the front porch rocker's. We loved the fact that shopping and restaurant's were close by. The Destin Harbor area is a place I could recommend. WONDERFUL, BEAUTIFUL, CLEAN, SPACIOUS HOUSE!!!! What a treat! We had the best Mother's Day ever at the beach staying at the Sundial and we have been going to Destin for many years! The house is so spacious, was super clean, comfortable, and cheerful. We loved the private pool (bigger than pictured) in the private yard- and the yard complete with flowers and rocking chairs on the front porch! The location is just wonderful- you are close to everything- the beach is a short walk with all kinds of restaurants, shopping, and activities close-by. Yet the area the house is in is quiet, charming, and just lovely! The owners are great to work with to boot! This is our new place at the beach- everyone in the group loved it- we will be back next year! We Love This Beach House!! What a wonderful beach cottage this is! It is so spacious, clean, and comfortable!! It has everything you can think of- and so bright and cheery! The pool was great- and the beautiful beach just minutes away. The location can't be beat- minutes from all kinds of shopping, restaurants, and all kinds of activities. 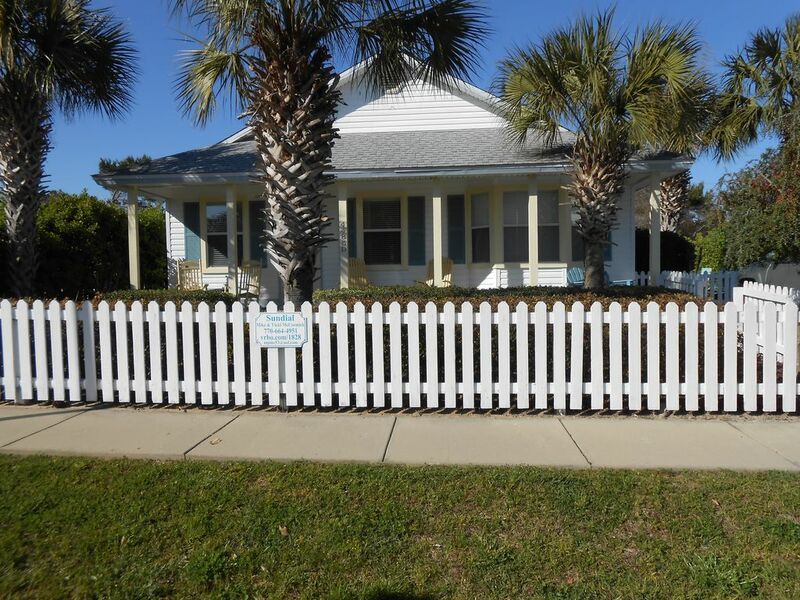 It's located in Crystal Beach- which is just lovely to walk around, quiet and peaceful, yet centrally located in Destin so you are near just about anything you would want to do! My family and I had a wonderful time getting together for our reunion and this house made everyone happy with loads of room! We all will be back again next year-to this great beach house! Thank-you! boutiques, Silver Sands Discount Outlet Mall and Destin Commons. Do try our night spots--lots of fun and variety! Security deposit required. Rentals to 25 and over. No street parking. Pool heating available in spring and fall for a fee. Cancellation policy 90 days before rental for a 100% refund.